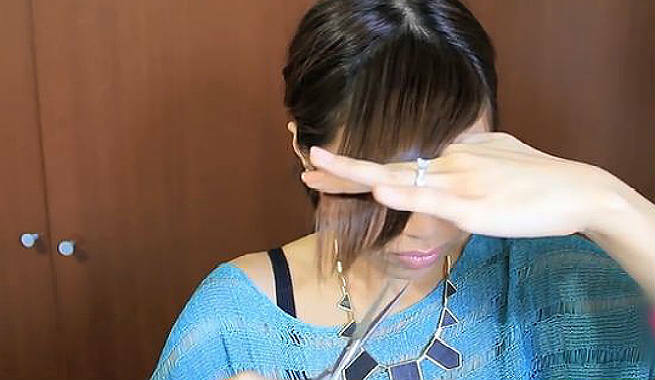 How-To: Trim Your Bang At Home And Skip The Salon Appointment! The first and foremost thing that you need for a perfect at-home bang-trimming is a pair of hair cutting / styling scissors. No, you CAN NOT bring safety / cuticle / office scissors into play even though it is a trimming job as these will cause split ends or even more serious hair damages. Rather, invest in a pair of branded shears and the end result will be brilliant! There are also quite a few budget choices that can be used at home for trimming different types of bangs. It is also essential to keep a good comb (having both wide and fine teeth), some hair clips, and a few elastic bands handy prior to starting the task. Do you think that wet hair makes the trimming of bangs easier? Let me correct you, then. 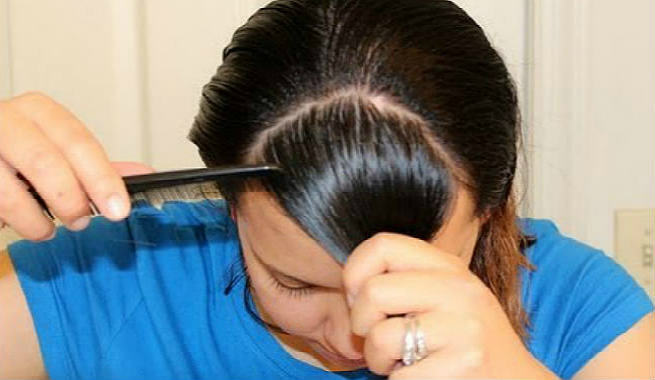 When you dampen your hair, it becomes straighter and longer than it is in the dry state and normally styled condition. If you trim your hair at that time, you might end up creating an extremely short bang by cutting it too much than desired. Hence, make sure that your hair, especially your bang, is completely dry at the time of trimming. Either air-dry it or make use of a blow dryer as per the requirements. Once your hair is completely dry, get ready to separate the bang neatly from the rest of your locks. To do this appropriately, hold the comb horizontally right on the top of your head while standing sideways to the mirror. The point where your head starts getting a rounder shape in the front is where you need to begin sectioning your bang from. Also consider two points on your frontal hairline which, when extended straight downwards, meet the arches of your respective eyebrows. Now, connect these three points virtually and separate this triangle-shaped section carefully. Now, it is time to prepare your bang for the trimming. It is advised that you go after the creation of your hairstylist and follow the previous style of your bang, especially when you are doing it yourself for the first time. Grab the ‘bang triangle’ and comb it the way you usually wear it. For a straight blunt bang, comb the section of hair in the forward direction. It will make the bang fall flat on your forehead. If you have a side bang, comb the section of hair to the side in order to bring them out and get a beautiful layered look. Meanwhile, make a ponytail or bun of rest of your hair or simply clip it up to prevent accidental snipping. Once you find the length of your bang, put it together and hold it down the right way based on the results you want. Start with grabbing the whole section of hair in between the index finger and middle finger of one of your hands (use your non-dominant hand for this purpose as the other one will be required for holding the pair of scissors). 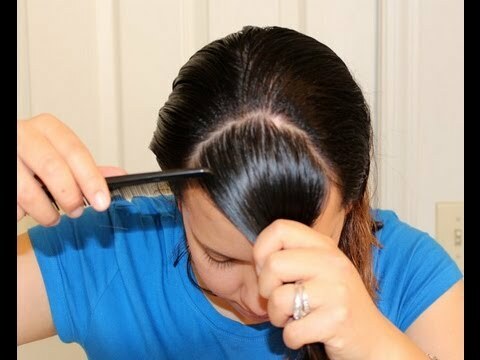 If you are trimming a straight, blunt bang, pull it out from your head in front of yourself and flip the ends slightly upwards. 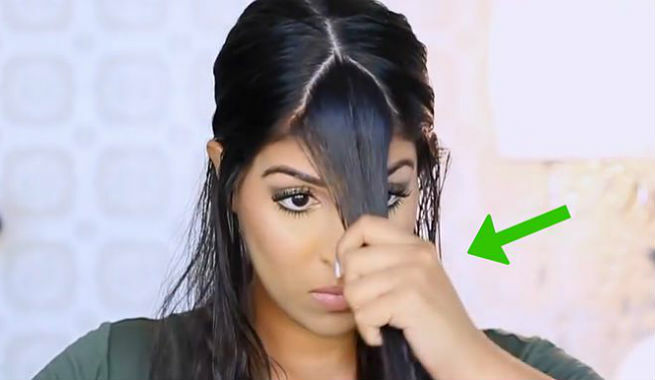 If trimming a side bang is your goal, pull it out to its opposite direction (for a left bang, pull it to the right and vice versa). Ensure that your fingers are placed at least a quarter inch above the ends, which will help you avoid too much trimming. Let your bang rest in the air at the levels of your eyebrows or nose while pulling it tightly and keeping your fingers straight and firm. Also, hold the pair of styling scissors in another hand in such a manner that its ends point upwards forming a right angle with your line of the bang. Now, start cutting into the bang right from the centre and proceed outwards with short increments as you reach your mid-eyebrows. This is perfect for a natural finish. For a bit sharper look, hold the scissors at an angle and trim the ends of the hair lightly. Let down rest of your hair, blend the trimmed bang with it, and run your fingers through it or simply brush it. If there is any long piece in front of your head, fix it accordingly to create symmetry. Ta da! You’re done with the trimming. Simply style up your bang and rock it!